First and foremost angels are spirits. Are not all angels ministering spirits? (Hebrews 1: 14) They do not have a physical body and they will never die, however they are able take on human form as told us in Hebrews 13:2 – Do not forget to show hospitality to strangers, for by so doing some people have shown hospitality to angels without knowing it. 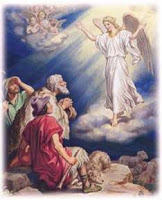 But those who are considered worthy of taking part in the age to come and in the resurrection from the dead will neither marry nor be given in marriage, and they can not longer die; for they are like the angels (Luke 20:35,36). God endowed the angels with powers humans don’t have, however they are still subject to Him and limited to His commands. Scripture also tells us that angels will be judged by humans. Do you not know that we will judge angels? (1 Corinthians 6: 3) Wow! Who would have thought?? ?